Is nature beautiful or is it useful? Should we protect nature for its own sake or for our own sakes? Is nature priceless or can it have a value put on it? The answer to these questions can all be ‘Yes to both’ but we don’t treat the natural world as though we would say ‘yes’ to any of them. We aren’t acting as though we love and respect nature, and we aren’t acting as though it is of financial value to us; we are acting as though it is pretty much expendable. In the past we have tended to go down the ‘love and respect’ route and that hasn’t worked too well. Many now propose we should go down the ‘financial value’ route because that might work better. It might, in particular, work better with finance ministries, business and economists. My own view is that we need to use both approaches and that the second deserves a bigger shot than it’s had so far, but the chances of HM Treasury being won over very quickly, particularly with Gideon Osborne in charge, are pretty slim. But this book doesn’t set out to champion one route or the other, it is a well-written primer so that we – maybe including Mr Osborne – can understand better the value of nature to us. And so we hear about the value of peatbogs as carbon sinks and as sponges that moderate water flows and therefore moderate flooding downstream. All of this will be bad news for grouse moor owners who are not only bumping off our Hen Harriers through acts of wildlife crime but also bumping up our house insurance and water bills through mismanagement of the uplands. That’s just one example, there are many others, and this book covers the ground in an engaging manner that is very accessible. Tony Juniper, the former director of Friends of the Earth (and birder and parrot expert), knows his stuff about the environment and about British wildlife, he knows his stuff about politics and about campaigning, he knows his stuff about climate change and about renewable energy. And he can write. It’s not a dry book, it’s a pretty easy read and if you are a regular reader of this blog then you might be surprised by how many topics covered or touched on here are found within the pages of this book. They include: beavers, wind farms, grouse moors, the Swansea Bay Tidal Lagoon, Hope Farm, ancient woods, farming, marine protected areas and many more. I recommend this book to the thoughtful naturalist (despite the two typos on the inside back cover, one of which is a bit embarrassing and is repeated in the text of the book). 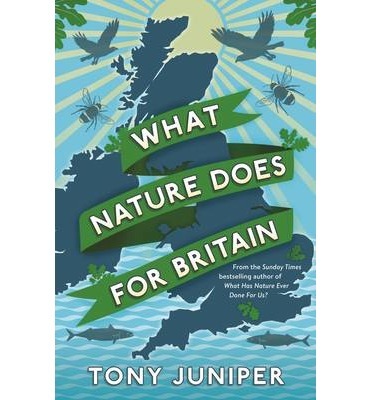 What Nature does for Britain by Tony Juniper is published by Profile Books.